Stock Gaylard near Sturminster Newton, is a traditional country estate in Dorset with Yurt Camping Holidays, shepherds hut glamping, Summer Concerts, country fairs & a wood fair called the Oak Fair. This special conservation event is held in August each year and centres on timber and wood craft. The Stock Gaylard House is a lovely Georgian country house which is open to the public on certain days of the year. It's really worth a visit to this gorgeous country estate with it's own deer park & picturesque lake, whether just for a day or for glamping holidays in the luxury yurts. 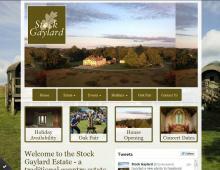 Stock Gaylard's 1,700 acres of Dorset countryside make the perfect place for luxury Yurt holidays. The private glamping yurts have been modelled on the traditional Mongolian yurt, with the latticed wall sections & roof poles being made from Ash wood grown on the Stock Gaylard Estate. The yurts offer two bedrooms, one with a double bed and the other with two singles and everything you need for a glamping holiday is provided, including bed linen, duvets, pillows, rugs and kitchen equipment. Solar power is used to provide indoor and outdoor lighting, as well as hot water for showers. Stock Gaylard's ethic is to provide a yurt camp with minimum impact on the environment and maximum comfort, luxury and serenity. The Withy Bed Yurts are positioned for a farm glamping experience to remember, sited near to the Stroud Farm Deer Park the yurts benefit from stunning sunsets and wildlife. A new addition to the Stock Gaylard estate is the Glamping Bus at Parson’s Camp. The converted double-decker bus is ideal for group glamping, family glamping and hen do glamping breaks in Dorset. The bus and bunkhouse can sleep 9 people comfortably for a glamping weekend getaway. Stock Gaylard also has a two bedroom self catering holiday cottage and a sawpit wagon with Shepherd's hut which can also sleep up to 4 people for glamping breaks. If you're looking for country estate holidays or Dorset country glamping this is a great place to choose!